The photos should show a close up of your face and the top of your shoulders so that your face takes up between 70% and 80% of the frame. Photos must be in sharp focus and correctly exposed. Shadows from the head must not appear in the background. Good colour balance and natural skin tones are essential. ‘Red eye’ in photographs is not acceptable. Photos must be printed on photo-quality paper at a high resolution. There should be no ink marks or creases. Digital enhancements or changes are not acceptable. The reverse of the photos must be white and unglazed. 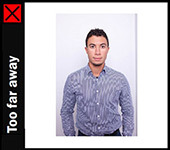 Black and white photos are recommended as they’re digitally printed onto the passport in black and white. But we also accept colour photos. Infants or very young children who can’t support themselves should be photographed lying down on a plain, white surface. No one else should appear in the photo, so make sure that hands or arms used to support the child are not visible. You cannot take a ‘selfie’ or use a webcam. You can take a photo with a digital camera or smart phone, but the zooming function on the smartphone should not be used. You need to stand in front of a completely plain, light grey, white or cream background. 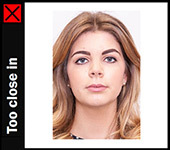 No objects such as door panels or plants should be visible in your passport photo. Your photo must be in focus, lighting and colour should be balanced, not too dark or too light. There must not be any shadows on your face or behind your head. Ensure your facial features are clearly visible, hair should not cover any part of the eyes. Glasses can be worn in your photo, provided the frame is not covering any part of your eyes and there is no glare on the lenses. Make sure your expression is neutral, you are not smiling and your mouth is closed. Do not tilt your head up/down or left/right. Look straight into the camera. For existing adult passport holders who are going to use the new Passport Online service, you should follow these guidelines for supplying them with their digital photo for their online application. Children, all first time applicants or adults wishing to use the existing postal channels will need a paper photograph taken to the existing standards. Make sure to leave some space around the head so that Passport Online can automatically crop the image when it is uploaded. Don’t go too close around the head or crop the image too tightly. Don’t go too far back, about mid torso is ok.
A colour photograph is required. The digital photo provided for upload cannot be less than 715 pixels wide and 951 pixels high. Provide the digital photo in JPEG file format for the customer to upload when making their online application. There must be no compression, loss or compression artefacts in the JPEG. Passport Online will not accept upload of a file larger than 9MB. Q. Can I use my previous passport photo? No. 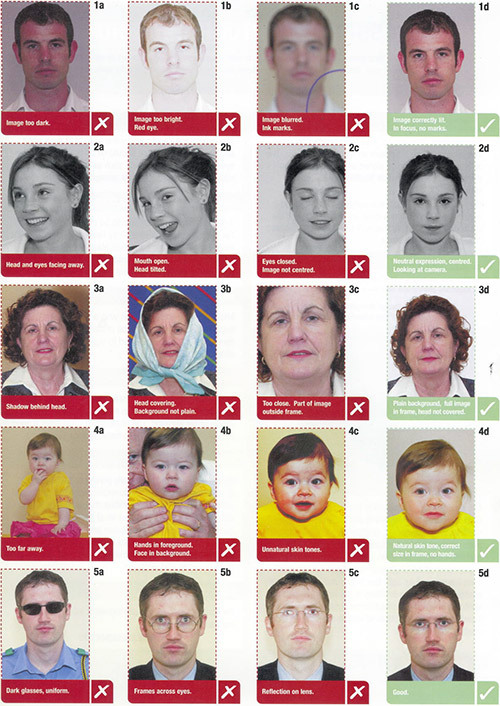 The photos required for an online application are different to those required for postal applications. Also, your photo must have been taken within the last 6 months. Q. I wear a head covering for religious purposes, is it ok for me to wear it in my passport photo? If you wear a head covering for religious reasons you are allowed to wear it in your passport photo. All other types of head accessories cannot be worn. Q. Can I wear glasses? Transparent glasses may be worn so long as the frames do not cover any part of the eye or cause glare or shadows. Sunglasses must not be worn. Q. Can my photo be a selfie? No. If using a smartphone/tablet to capture your photo, ensure that someone else takes the photo for you. 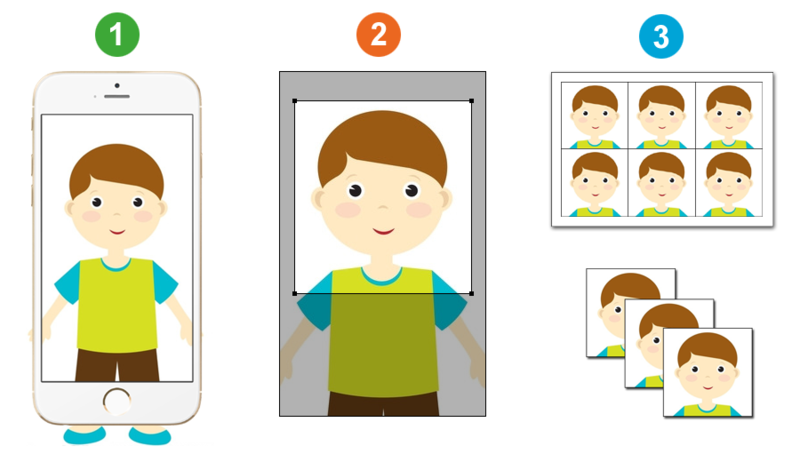 Consult the photo guidelines before taking and submitting your photo online. Applicants who submit selfies will be asked to provide another photo for their application. This will delay the application process. Q. 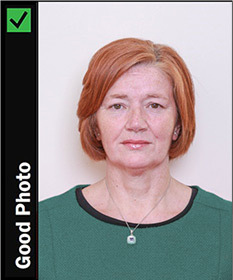 Will my photo appear in colour on my passport? No. The photo on your passport will be in black and white. You must submit a colour photo which will be converted to black and white during the application process.